With its arched neck and bold statement body adding character to the kitchen, the Darwin C Spout is the latest addition to the Original Systems range. Complete with advanced filter technology, the UK manufactured kitchen tap provides the household with instant filtered drinking water at the turn of a handle. The equisite design has a dedicated waterway within a single spout, delivering water without cross-contamination. Use with our Katadyn filters to ensure healthy, freshly-filtered drinking water. --High grade, low lead, solid brass construction, plated to a thickness that exceeds industry standards, ensuring a deep protective coating, which is luxuriously pleasing to the eye and resistant to wear. --Employing unique Triflow three lever layout operating system. --Fluhs™ 1/4 turn precision ceramic valves. 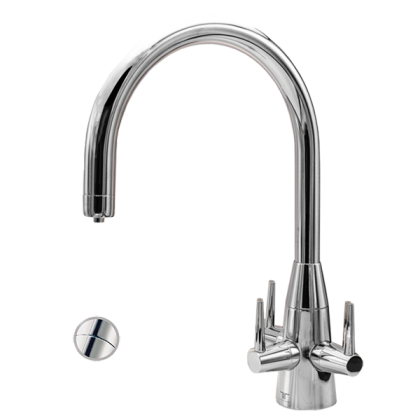 --Dedicated waterway within a single spout for cold filtered water delivery, which avoids cross-contamination. --High performance Swiss-made ceramic filter cartridge affords the benefit of cold filtered water, removing impurities down to 0.2 microns. --Filter housing is manufactured from 304L stainless steel, offering superior hygiene properties. --Bearing rings and ‘O’ seals are fitted on handles and spout to ensure maximum durability. --Filter cartridge is easy to change — no tools required to open the filter housing unit. --Easy to install filtration system; fits comfortably under kitchen work top. --Two year warranty on stainless steel filtration unit.